We're proud to sponsor the American Cancer Society's Making Strides Against Breast Cancer events in Florida. Have you taken the Pink Chair Challenge before? You'll find an inflatable pink chair at some of the upcoming Making Strides events. To help raise awareness about breast cancer, take a photo of yourself at one of your local pink chair events and share it on Instagram with the hashtag #BigPinkChairPic and #SeacoastCares. You can also take a Snapchat pic with the Geofilter and export to Instagram! Get ready for your picture! You can either get a picture of you taken in regular camera mode or in selfie mode! To get to selfie mode, click the camera icon on the top right, there should be a little smiley face so you can see yourself now. Once you’ve decided on your pose, take a picture. 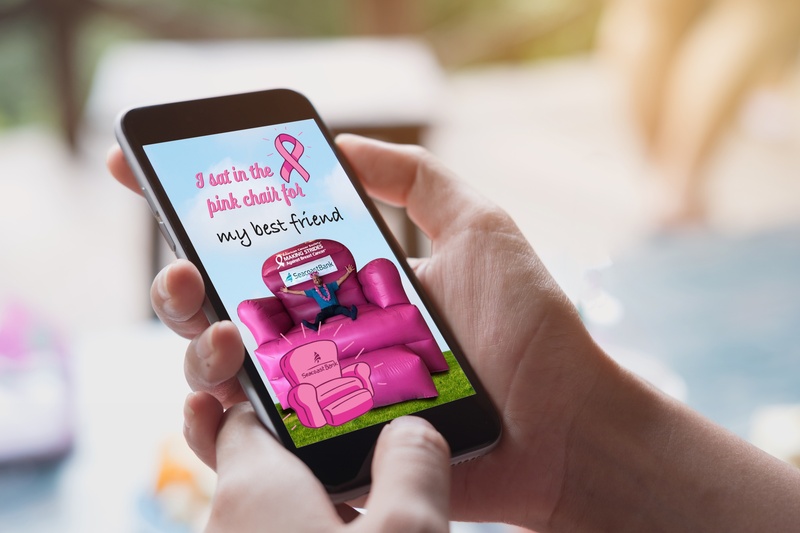 After your picture is taken, swipe to left on the picture and find the right filter you want to use for your #BigPinkChairPic. There are a few to choose from. Then, on the bottom left, click the downward arrow button, which saves the picture to your Snapchat Memories. After you saved the picture, click the top left “X” and you’ll see the camera screen again. Click the two little picture frame icons underneath the big circle at the bottom. Now you’re in your Snapchat Memories! Find the picture you took with the filter under one of the tabs above, and click on it. Your picture should be at the top since it’s recent. Once your picture is opened, press on the photo for a little (long press) until a menu comes up from the bottom. Then, click Save Image so it’s on your Camera Roll! Last step! Open Instagram and you should have your recent picture available to upload! Don’t forget to caption your Instagram and use the hashtag #BigPinkChairPic and #SeacoastCares so we can find your cool new pic.